Lopes Tembe Ndelana was born on March 20, 1937, in Maputo. He is married and has six children. He attended primary school in South Africa at the Holy Cross and Swiss Mission Schools. He studied through the International Correspondence School (Cape Town), Kwame N’kruma Institute (Wineba, Ghana), Kivokoni College (Dar es Salaam, Tanzania) and at the Military Academy of Enchasse in Egypt. His long career began in 1974 at the Office of the Prime Minister of the Transitional Government in the Department of International Cooperation. He was later promoted to Chief of State Protocol in the Ministry of Foreign Affairs (1975-1978) and then served as Deputy Director of the National Commission for Communal Villages (1978-1983). He was also Member of Parliament between 1977 and 1994. 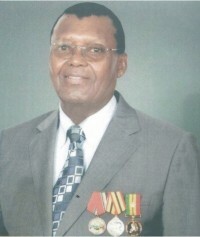 Lopes Tembe Ndelana is currently a retired Ambassador. He was Ambassador Extraordinary and Plenipotentiary of Mozambique to the Peoples Republic of China, Democratic People’s Republic of Korea, Pakistan and Japan (1983 and 1989); and the Republic of Zimbabwe and Botswana (1989-1996). He served in the Kingdom of Swaziland between 1996 and 1998. He is a polyglot who speaks English, Portuguese, Swahili, ChiNyanja, Ronga, Zulu and Shona.